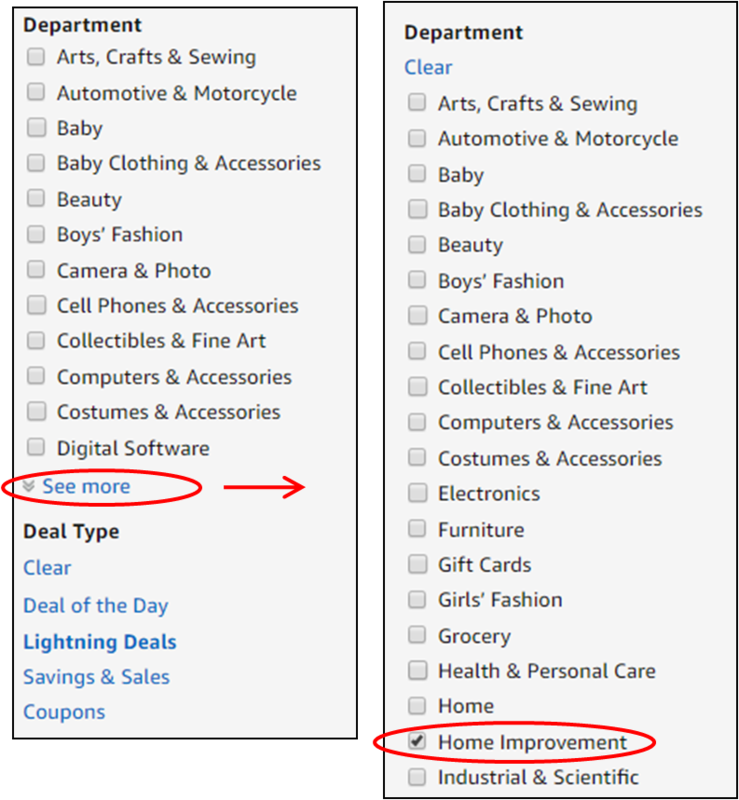 If you are like me and are primarily interested in flashlight, knife, and tool deals on Amazon, then I recommend that you narrow your Lightening Deal and Savings & Sales searches by selecting the Home Improvement department. From experience, this department contains all the deals that generally interest me. See illustration below. Checking this box saves me a lot of time every day! Edit: I stand corrected. There are lights and lanterns that appear in Sports & Outdoors that do not appear in Home Improvement. There may be additional knives in in Sports & Outdoors too. Thanks for the heads up Blackbeard! Very nice tip thank you. Linked to this thread in the Amazon Deal's thread OP. I just kinda hang out here and wait for one of you fellers to tell me about ongoing or upcoming Amazon deals. I confess I’m too late to capitalize on some of the sales when using that method. That’s the price I pay for being lazy. For just flashlights, google “flashlight” “amazon”. Which brings up “Flashlights | Amazon”, which, when clicked, will show any related Lightning Deals. Just save the Flashlights | Amazon link and then you have one-click browse of the latest flashlight Lightning Deals. Great tip! Here is the link - I've bookmarked it. Thanks! I just leave the above page open and refresh (with the F5 key) every once-in-awhile. Keeps me up-to-date on Amazon flashlight Lightening Deals with no effort! … $30 a month for an app called BrickSeek, which helps him find markdowns at big-box stores like Walmart and Target. A few weeks ago, Myers hit multiple Walmarts within a 150-mile radius and came home with 218 packages of lightbulbs. He found them on clearance for $2 each. He marked up the price and netted $4 to $5 on each package. Yeah thanks Active Al and I just clicked on the link and Thorfire TG06S AA/14500 light for $10 bucks after coupon! Better put this in the correct thread. Al’s the man. Great info. But in order for this to work you have to be online constantly. Amazon is warning investors of one of the biggest problems facing its online marketplace: counterfeit products. Under the “risk factors” section of its annual report, Amazon added a new line addressing counterfeit problems on its marketplace. “We also may be unable to prevent sellers in our stores or through other stores from selling unlawful, counterfeit, pirated, or stolen goods, selling goods in an unlawful or unethical manner, violating the proprietary rights of others, or otherwise violating our policies,” the filing said. Amazon could also set the bar a little higher for Chinese sellers trying to sell existing products. Because 9/10 times I’d bet they are ripping off an established brand – the margin math wouldn’t work and I’ve never heard of any brand selling to a Chinese seller to then sell on Amazon USA. But if you buy anything on Amazon, take a minute to look at the seller. Better yet, buy products direct so you can be assured you are not getting a fake. I dropped my Prime membership in Dec because Prime two-day shipping was hit-or-miss and the free Prime movies I hadn't already seen were second rate. On top of this, they raised the annual fee. My feeling is that Amazon may be in trouble in a lot of areas. Yeah, but I do no have phone with me all the time. Even then you have to jump on it right away.